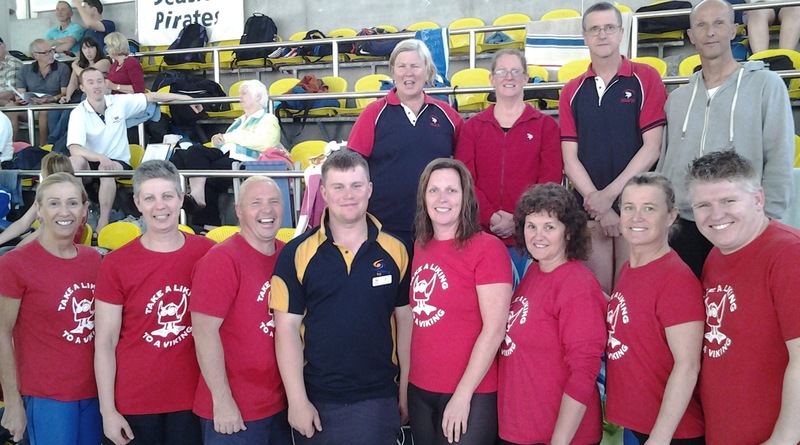 Our team of fourteen travelled to Woy Woy for the 2014 NSW State Short Course Championships held over the weekend of 18-19 October. Woy Woy is known to be a fast pool and our swimmers put in some excellent times throughout the weekend with many achieving significant PBs across multiple events and many of our swimmers finding themselves in the same heat as another Viking. Saturday started with some (Brenda Day, Ann Reid, David Bale and Andreas Falkenau) taking on the 200m Butterfly – what a heart-starter event that is! Great swims by all four of those flyers! Katrina Burgess had a great race with Christine Sefton from Myall Masters in the next lane pulling her along in the 100m Breaststroke, and Katrina finishing in a super new PB time just behind Christine. Roger Dietrich also showed his strength and determination to swim his second fastest SC time since joining Masters in 2011. Greg Gourley and Caroline Makin went head to head in the 50m Freestyle – just one lane separating them – Caroline managing to touch the wall just half a second ahead of Greg in a new SC PB time. Gary Stutsel put in a solid performance in what is probably his favourite event, given his nine weeks of holidaying preparation for this meet! In the 200m Individual Medley – another killer event, Brenda Day, Richard Flockart, Anne Smyth and Andreas Falkenau all put in solid swims to each secure a medal. In the next 50m event – the 50m Butterfly - Greg Gourley found himself going head to head with Anne Smyth this time in the next lane. Greg came in half a second in front – with both swimming a respectable sub 40 seconds. A first ever attempt at this event saw Donna Campbell put in a solid swim and a benchmark for her swim in this event at the Pan Pacs next month. The 100m Backstroke saw more of our swimmers head up and down the pool on their backs with another excellent PB from Katrina Burgess with son Kade finishing his swim in a new PB also. Coaches Anne Smyth and Caroline Makin went off together in the same heat of the 200m Freestyle on the other side of the pool to one another and Caroline’s recently found 200m pacing ability saw her finishing with an super new SC PB time, whilst Anne put in a really solid swim given her lack of training preparation. Leisa Cass showed her strength in this event and was rewarded for her hard training with a fantastic new PB breaking 2:50 for the first time ever! On Saturday evening ten of us gathered at the RSL club in Ettalong Beach for dinner and a few liquid carbohydrate replacements to set ourselves up for another great day of racing the next day. Sunday’s program saw some amazing performances again from our swimmers. Although it should be pointed out that we witnessed epic failures by two of the coaches of all people in the 100m Individual Medley! … Brenda Day and then Leisa Cass both came to the end of the backstroke leg and efficiently executed beautiful backstroke tumble turns, before realising they were meant to touch the wall with one hand and push off on their front ready to swim breaststroke – both errors were spotted by the ‘Judge of Strokes’ and the ladies were promptly disqualified! …. So perhaps we’ll be taking everyone to task on the Backstroke to Breaststroke IM turn before the next meet! Roger Dietrich went head to head with Paul Bailey from Warringah in a repeat of the 200m Breaststroke race in Geelong at the Australian Masters Games 12 months earlier – Roger yet again pipped Paul Bailey by 1.5 seconds for a bronze medal in their age group. Leisa Cass and Ann Reid went head to head in the next lane to one another in the 100m Freestyle racing in the same age group – Leisa pipping Ann by a slither of 0.19 seconds – great swims by both ladies in a sub 1:20 time! David Bale followed not long after the ladies, and swam an excellent race to secure a nice quick time in one of his favourite events. In the 50m Backstroke, Kade Burgess was fairly happy with his time of 31.03. Donna Campbell knocked a staggering 3.5 seconds off her previous PB in this event just one month earlier at Tuggeranong pool, and Caroline Makin also finished with a long awaited PB! Richard Flockart, Andreas Falkenau and Anne Smyth all swam hard in the 100m Butterfly with Anne swimming in the next lane to her competition Sandra Rogers from Seaside Pirates – finding herself not able to quite keep up with Sandra’s pace in the later half of the race unfortunately but still securing the bronze medal in her age group. Andreas is getting fitter and faster again with a focus on his Butterfly swimming at the moment which is lovely to watch! Kade Burgess showed his sprinting prowess and his underwater ability in his 50m Breaststroke with a fabulous 11-12m underwater pull-out after his turn at the 25m mark! 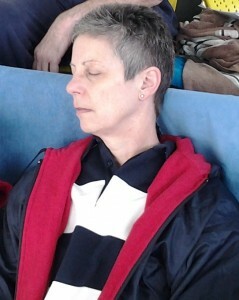 Donna Campbell produced another PB in her swim in this event, showing an improvement of over 2 seconds in only 2 months. Katrina Burgess took on the 200m Backstroke with Greg Gourley in the lane next to her and led the heat the whole way, finishing a long way ahead of the rest of the field with an excellent new SC PB time. Caroline Makin followed in the next heat and again showed her recently found ability in swimming the 200m distances – this time in Backstroke – and another super PB. Kade Burgess swam a very quick 8 laps and romped home in a super fast and well deserved PB. One of our members was caught having a little nana nap in the spectator stand before her next race, whilst most of the time the Vikings could be clearly heard cheering on their teammates throughout the proceedings. Both days finished with relay swims with our teams performing strongly across the age groups, and winning the final race of the day – the Mixed 120+ Freestyle Relay with the team of David Bale, Katrina Burgess, Caroline Makin and Kade Burgess. All in all, it was a great weekend of swimming with some fabulous personal achievements by our swimmers.